Despite having no outright energy cost subsidy for solar thermal systems in Singapore, the main growth area in this segment still lies within the residential building sector. Nonetheless, there are signs that adoption is picking up within the commercial and institutional building sector, such as office building, hotel and schools. The technology has been gaining popularity in Singapore through various energy efficiency policies coupled with supporting financial mechanisms to help defray some capital outlay for green building systems. The main application is residential solar water heating system. Hot water produced is for domestic usage. They are typically flat-plate collector system which consists of an absorber, a header and riser tube arrangement. Solar cooling system is slowly gaining prominence in the commercial building sector. Solar thermal air-conditioning system where solar heat is harnessed for absorption chillers is one such application adopted. The solar cooling system at the United World College of South East Asia (UWCSEA) has solar collectors covering an area of 3,900m². The system generates approximately 2.2 GWh annually, providing 100% of hot water demand in the campus and about 30% of the air-conditioning requirements. Another example is the solar air-conditioning system installed at Tampines Grande by City Developments Limited. This 1,160m2 vacuum tube water heating panels produce hot water for use by the adsorption chiller to produce chilled water for the air-conditioning system. http://www.cdl.com.sg/app/attachment/cdl/social_responsibility/environmental_policy/cdlbusiness_sust_2.pdf Press Release. (December 07, 2011). SOLID ASIA Unveils World's Largest Solar Cooling System at UWCSEA in Singapore. Available: http://www.edb.gov.sg/edb/sg/en_uk/index/news/articles/solid-asia-unveils-world-largest-solar-cooling-system-at-uwcsea-in-sg.html. High energy demand and scarce energy natural resources have placed Singapore in a unique situation where the economy is impacted by fluctuation in energy supply and their prices. Therefore, diversifying energy sources and promoting energy efficiency is vital in ensuring energy security. Multi-agency committees have been established to drive and coordinate energy efficiency improvements in Singapore. The building sector is one of the various sectors which the committee is promoting energy efficiency through various policies and measures. There is no domestic manufacturing base for the solar thermal industry in Singapore. There is no available information on employment within the solar thermal sector. The average cost (including Goods and Services Tax) of installing a residential solar thermal heating system of 180 litres capacity is S$5,500 for normal copper plating and S$6,500 for titanium coated copper plating. Prices vary a lot depending on the project size, system type and ease of installation. The interest in Singapore is more towards green buildings than solar buildings, in particular, the area of building energy efficiency and environmentally friendly construction processes. Passive and active design principles, together with relevant technologies are incorporated into green buildings to reduce energy consumption and improve building energy efficiency. With growing global concerns about the sustainability of the built environment, the construction industry in Singapore is encouraged to adopt green features and technologies / systems in their projects. There are significant and growing opportunities for green building services and related products. 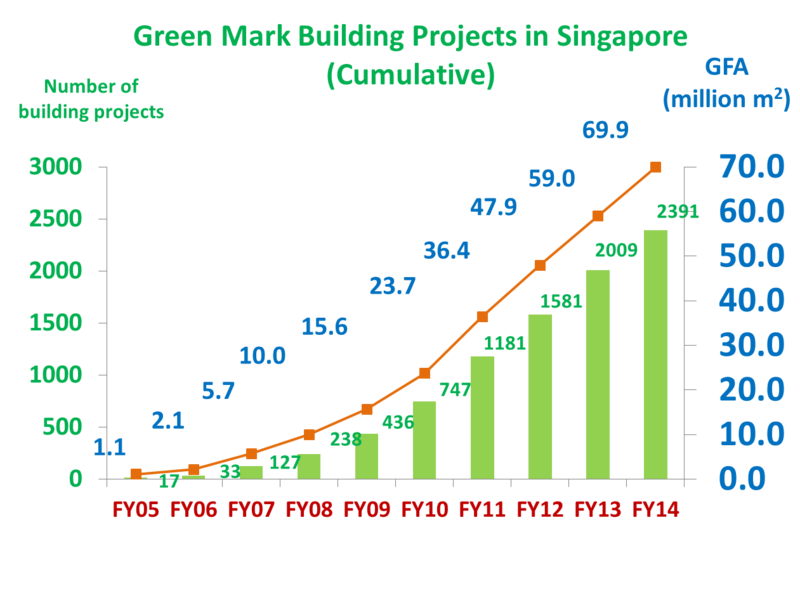 The market for new green building projects has increased and growing robustly as shown in Figure 1. Given the favourable strategic location in the tropical Sunbelt, Singapore receives about 50% more irradiation compared to temperate regions. Solar photovoltaic (PV) panels are gaining popularity in building design with pricing of the solar photovoltaic (PV) panels getting more affordable. Solar photovoltaic (PV) technology adoption in Singapore has increased over the years. 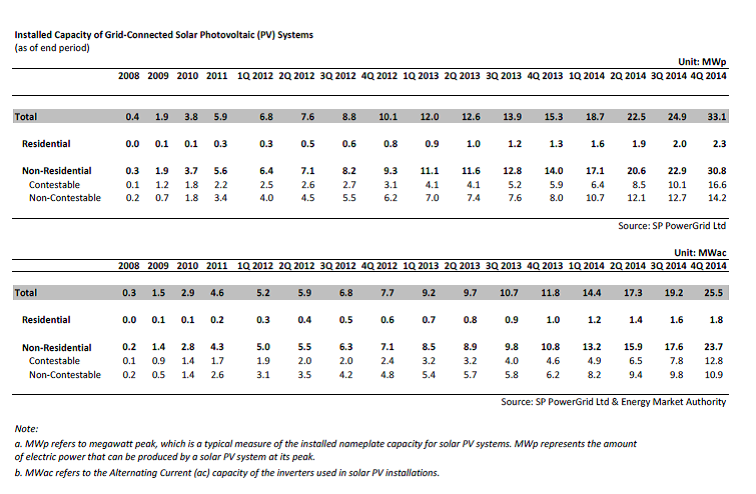 At present, there is a totalled installed capacity of 33.1 megawatt peak (MWp), for residential and non-residential (as of 4Q of 2014) solar PV installations connected to the grid as can be seen in the following Table. More solar panel installations are expected on the rooftops of public housing and non-residential buildings over the next few years. The main drivers for green buildings are rising energy costs and building standards by the government to actively promote green building design, construction and sustainable developments in Singapore. The regulations are coupled with local policies as part of national strategies documented in the Sustainable Blueprint to achieve the goals and quantitative targets set. BCA’s Green Building Masterplan, which aims to achieve the target of having “at least 80% of the buildings in Singapore to be green by 2030”, is one of the key national plans driving the deployment of new energy technologies in the building sector. Associated with this Masterplan is the Green Mark Scheme to grade building performance to energy and environmental criteria. Regulatory standards and best practices were also established surrounding the deployment of solar photovoltaic (PV) in buildings. The Green Building industry creates various new career opportunities in the building employment landscape. The practice of constructing green buildings and using processes that are resource efficient to limit the environmental impact requires skilled workers - such as architects, engineers and general contractors, craft worker and subcontractors – embracing more environmentally-conscious role with new knowledge of new design and construction techniques. The growth of green buildings also generated new career opportunities – such as Green Mark Manager, Green Mark Facilities Manager, Green Mark Professional and the Green Mark Facilities Professional in areas of energy and energy facilities management - for building facilities and maintenances sectors. It also indirectly creates jobs for green technology providers like solar photovoltaic system installers (also known as systems integrators). Due to limited land space in Singapore, most of the buildings are high-rise. Furthermore, over 80% of Singaporeans lives in high-rise public housing developments known as HDB estates, while the rest would live in condominiums, mixed developments, private cluster houses, terraces and bungalows. Generally, building prices vary with respect to building type, project size, its location, design, sophistication of building systems, quality of finishes and green features. For instances, the premium associated with incorporating green building technology for a green mark platinum development ranges from 3-5% in its incremental cost compared to similar buildings without green features. Solar Energy Research Institute of Singapore (SERIS) was established in 2008 and is housed in the National University of Singapore (NUS). SERIS is a comprehensive solar research centre twhich conducts research and development (R&D) in solar photovoltaics, solar devices and green buildings. It carries out applied research to develop solar technologies with economic potential as well as developing and training R&D manpower for Singapore. It develops and tests innovation of solar energy technologies that are particularly suited for hot equatorial climate regions such as South and South-East Asia. Examples of their research interests include building façade technologies (including daylighting and building-integrated photovoltaic, BiPV) and solar-powered dehumidification systems suitable for air-conditioning systems. Differentiating itself through industry-oriented research, SERIS is currently collaborating with leading solar companies like REC and Trina Solar. SERIS is fundedby Singapore’s National Research Foundation (NRF) through the Energy Innovation Programme Office (EIPO), an inter-agency workgroup responsible for planning and executing strategies to develop the energy sector in Singapore. The Energy Research Institute at the Nanyang Technological University (ERI@N) was launched in 2009.. Its research focuses on improving the efficiency of current energy systems while maximizing synergistic effects of alternative energy solutions. ERI@N’s aim is also to develop industry-oriented innovations and train specialists in clean energy, focusing on areas such as wind and marine renewables, green buildings, e-mobility, energy storage and fuel cells. Various research centres within ERI@N were set up to facilitate cross R&D effort. Two notable are Centre for Sustainable Energy Research (CSER) and Solar Energy and fuels Centre (SEfC). The former focuses on investigations in advanced fuel cells, charge storage, wind/tidal energy and energy efficiency and green/smart buildings while the later research in solar fuels, solar photovoltaic, solar thermal, photo-catalysis and photo-electrochemical conversions. It is also collaborating with industry partners such as Rolls-Royce, DNV, Bosch and Vestas. SERIS currently focuses on two main areas: “photovoltaic electricity generation” and “solar and energy efficient buildings”. In area of photovoltaic electricity generation, the main emphasis is on silicon-based photovoltaic, which includes characterisation, simulation and module analysis. In organic (plastic) solar cells areas, it mainly focuses on bulk hetero-junction organic solar cells with the aim to develop very cheap flexible solar cells that can be produced by printing technologies and to do use-inspired basic research on solar cells that constitute model systems for a novel class of photovoltaic devices. In area of solar and energy efficient buildings, it looks into three main topics, namely, façade technology, simulation and building integrated PV and solar-assisted air-conditioning for tropical climates. ERI@N’s solar energy and solar fuel pursued areas in nano-structured metals and novel cell architectures, nano-materials for multifunctional applications focusing on nano-net-based devices in solar cells and improving the absorption and stability of cells by looking into new absorbers and hole transporting material for quasi-solid/ solid state sensitized solar cells7. Green/smart buildings research at ERI@N is focused on building energy efficient and intelligent building systems and controls. Enhanced Air Quality Pte Ltd (EAQPL), a spin-off company from the National University of Singapore, have developed a Single Coil Twin Fan (SCTF) air-conditioning and air distribution system which provides "demand ventilation" and "demand cooling" by dynamically responding to the varying needs in the occupied zones of a building. This patented system is based on decoupling the ventilation needs from cooling needs. SCFT system enhances occupants’ thermal comfort and indoor air quality in tropical buildings while significantly saving energy of 5 to 15 per cent of conventional air-conditioning system. Natflow Pte Ltd, a Singapore company, has developed an innovative solution to recover waste heat to generate hot water. The result was an energy-efficient hot water system which gained commercial adoption. This system, which has since been installed in Singapore Changi General Hospital, has achieved annual savings of up to S$150,000 and a reduction of up to 175,000kg of carbon emissions annually for the hospital. Another is the Passive Displacement Ventilation (PDV) system which moves cooled-air in a room without the use of fan system. The system was successfully test-bedded at the Building and Construction Authority (BCA) Academy and is currently being adapted for use in buildings in the Ministry of Manpower Service Centre and Nanyang Technological University. The scheme and policies available are not targeted particularly at solar thermal and solar buildings. Most of the financing mechanism in place is indirectly for energy efficiency requirements for buildings. The Energy Innovation Programme Office (EIPO)’s Solar Capability Scheme was set up to boost the use of solar technologies in buildings. Through such schemes, solar photovoltaic (PV) systems have been deployed in various public housing estates by retrofitting existing precincts with solar panels and integrating solar PV systems into new precincts. The generated solar electricity helps to offset the energy consumption in the public spaces and common areas of these public housing estates, which will eventually translate to savings for the residents. Private sector projects – such as Ocean Financial Centre; REC’s Integrated Solar Manufacturing Facility; SOLID Asia’s project at United World College’s (UWC) Tampines Campus - also benefited from this scheme. In Singapore, the Building and Construction Authority (BCA) launched the Building Retrofit Energy Efficiency Financing (BREEF) Scheme as a pilot financing scheme in collaboration with several financial institutions to provide funding to property owners to retrofit their buildings to increase their energy efficiency. As a pre-requisite, the building must maintain its Green Mark certification for period of loan tenure and BCA will share the risk of any loan default with the banks. c) Aggregate demand for solar amongst public sector agencies to achieve economies of scale. c) Encourage private sector adoption of solar. In doing so, the programme is projected to raise Singapore’s adoption of solar power by government agencies to 350 MWp by 2020. EDB is working with the government agencies to finalise the implementation details of the SolarNova Programme.